iSpring Pro is a professional PowerPoint add-in which creates Flash movies from your PowerPoint presentations with an outstanding quality. 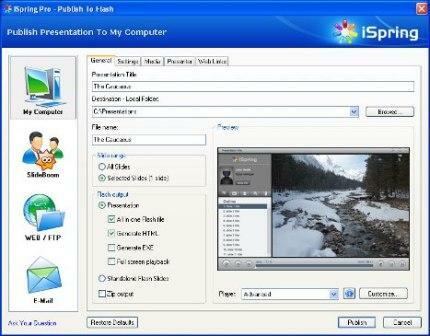 In other words, iSpring Pro is a PPT (PowerPoint presentation) to FLV (Flash animation) converter. Once in Flash format, the slideshows can be published on your web site, blog or SlideBoom.com portal and shared with millions of the Internet users. The latest new version of iSpring Pro, iSpring Pro 3.5 supports Microsoft Office PowerPoint 2000-2007 and can run in Windows 2000, XP and Vista. If you intend to purchase a commercial business license for iSpring Pro 3.5, the software costs a hefty price tag of $199. For today only (June 9, 2008), Giveawayoftheday.com is giving away a free license for iSpring Pro 3.5 for home users on personal use. The rule is always the same, install the application by today. Download the free iSpring Pro 3.5. Once downloaded, run Activate.exe to install the necessary registration serial number into registry, and the install iSpring Pro 3.5 by running Setup.exe. Some user may encounter problem in Windows Vista where iSpring Pro is not registered and still ask for serial number to register as full version product. In such case, run Activate.exe as administrator in high priority elevation mode. It’s also useful for users who need to backup the iSpring Pro PPT to Flash converter in case of disaster, or need to reinstall in later day.